Once again Friday’s word of the day relates well to our current political discourse in the US…or rather the lack thereof! We have become so polarized that the idea of compromise, of civil debate or the rational exchange of ideas, is all but impossible. Being passionate for a cause is certainly a noble thing, but one runs the risk of developing tunnel vision. We need each other. We need our differences of opinions, beliefs and ideals. We need to be able to debate the issues that are important to us while respecting each others’s passions. Making room for others doesn’t limit us. It expands us. 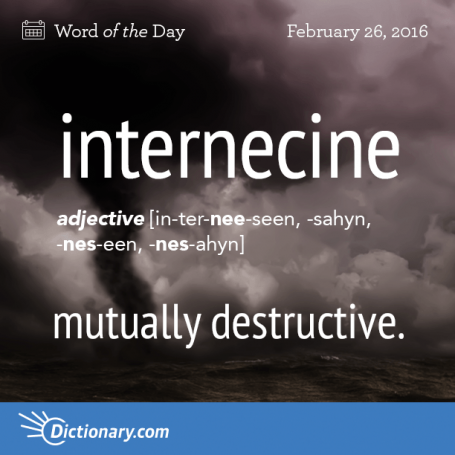 When it comes to Friday’s word of the day, internecine, it’s quite probable that nobody will win in the end and we will simply grow more and more distant and isolated. NEW! Word of the Day Haiku Challenge! 1. Pick a day that works for you. Once you pick your day, stick to it. This is what makes it fun and quite a challenge. 2. Choose an online dictionary that features a word of the day. I use dictionary.com but there are others. Pick your go-to dictionary. 3. Create a Haiku using the word of the day. In this challenge, no synonyms allowed. 4. A Haiku is a three line poem with the syllable structures 3-5-3 or 5-7-5. 5. (Optional) If you want, you may also post a expanded history of the word, your thoughts about the word, or some unusual facts about the word of the day. 6. Post a link to your Haiku in the comments so I can find you. 7. I’ll post the weekly roll call list on Sunday. So you have until Saturday at midnight (EST) to post your haiku. I’m renaming this weekly post Word of the Day Haiku. Hope to have at least one haiku for each day of the week. I’m looking forward to reading your Word of the Day Haiku! 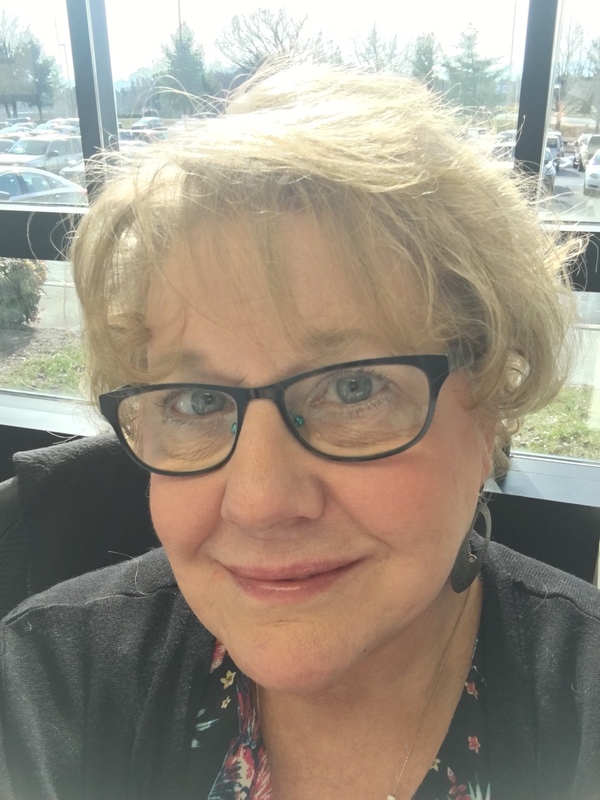 This entry was posted on Saturday, February 27th, 2016 at 2:13 am	and tagged with Challenge, Haiku, internecine, polarized and posted in Challenges and Writing Prompts, Essays, Haiku, Poetry, Word of the Day Haiku. You can follow any responses to this entry through the RSS 2.0 feed. I love the word! But I’m confused about the pronunciation in your image. Do you just go with the first one? Or maybe I don’t know how to read all that, lol! One dictionary I looked at said it sounds like “vine” at the end. Though I am sure that linguists may argue the pronunciation given the three choices listed here! Very appropriate given its definition. Haha! And by the way, I am so sick of politics right now. How sad, huh? I should be enamored to be involved and excited in voting for a candidate, but this is the first time in my voting history I have zero to be excited about. A brilliant word, aptly describes the world right now. As individuals we have to accept it can’t always go our way and even with compromise one party will come out happier that’s life. Yes! We live in a world where everyone expects to win a trophy for merely participating. I have to trust goodness and truth will eventually rise to the top! Awesome, Kat! You have started a Word of the Day Challenge! I really like your word of the day today, it does sound like our current politics. What a mess! I am going to give it a go. I use the same dictionary so I will see what words the next few days bring. I put mine in your comments. I am not very familiar with Haiku except from reading yours and others so I won’t be very good at it like you are. Good haiku. We need a talking dictionary? But i bet there is one in here somewhere. Oh I can think of some uses for this word . This is fun way to learn!